Medium Thick Sticky Note Pad 50 Sheets 4" x 3"
Sticky Notes 50 Sheets 4" x 3" customized with your logo. 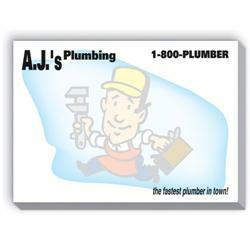 This inexpensive promotional product is great for mailing or handing to your customers. We help you with your art - even with "phantom" or light logo imprints such as shown here - just ask! FREE SET-UP AND FREE 4 COLOR IMPRINT! Production Times Available: 5 working day standard production. Free Rush Production Available, Please inquire. Typical Imprint Area(s): Actual size:3 3/4" x 2 5/8". Available Imprint Options: Phantom or ghost imprints are available at no extra charge. 10% is usually recommended if you intend to write over the phantom imprint.